We posted the report from winner Anna van der Breggen's Boels-Dolmans team with the results. 31-year-old Amanda Spratt has claimed the silver medal for Australia at the UCI Road World Championships in Innsbruck, Austria today. Spratt went with a smart move on the first of three finishing laps, before proving the biggest challenger for new world champion Anna van der Breggen (NED) who claimed a strong solo victory. 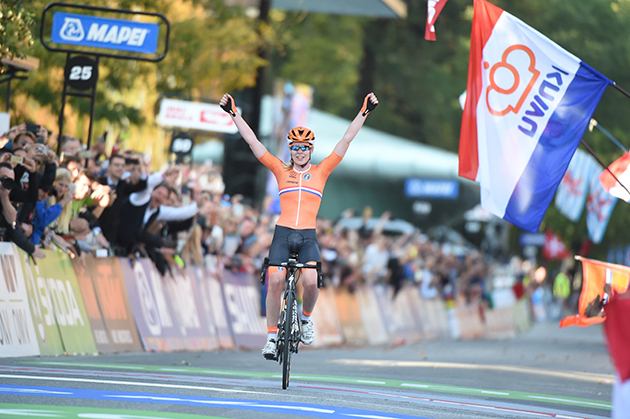 Anna van der Breggen finishes alone to win the World Championship. Sirotti photo. “I’m definitely happy with the silver medal. I can be very proud of this. The Australian team did a very good job protecting me in the early laps. When I made my move, I was expecting the Dutch to come across and Anna [van der Breggen] came across. After suffering an earlier crash, Ellen van Dijk was involved in an attack for the Dutch squad. After that move was caught, Coryn Rivera went solo on the summit of the first ascent of the mountain, staying clear for some kilometres before she was caught by a group of chasers which included Ellen van Dijk. Lucinda Brand was active for the Netherlands in the bunch behind, with Ruth Winder and Leah Kirchmann also in that group for the USA and Canada. A solo attack from the Netherlands went clear from the reduced bunch, going on to catch the Coryn group. Initially able to follow the move, a strong performance saw Coryn chase two riders who were solo at the front of the race before she dropped back to the main group. Lucinda rolled across the line as the team’s top finisher taking 9th place, with Ruth one place behind in 10th. PORTLAND, Ore. (BRAIN) — Former pro racer Floyd Landis will open three legal marijuana dispensaries here this week, each designed with a cycling theme to appeal to fitness and health-conscious adults. The locations have previously been operated under a different name; Landis told BRAIN his company, Floyd's of Leadville, has started the process of acquiring the dispensaries and rebranding them as Floyd’s Fine Cannabis. New signs were installed Thursday. Landis said the Portland stores are being given a cycling-themed makeover to take advantage of his history in the sport and to appeal to those who are interested in legal marijuana for its health benefits. "We are obviously trying to exploit my ability to get press because my name is very connected to cycling. We are branding and marketing toward people with an active lifestyle, not stoners — not that there's anything wrong with that, but that's not who we are trying to reach. We are selling to people who have decided that taking a bunch of Advil every day is maybe not that great of an option." Landis' company has two distinct business: the dispensaries, which will sell Floyd's-branded recreational marijuana products and products from other brands, and its business selling products containing CBD, a non-psychoactive cannabinoid. The CBD products are sold through bike shops and other outlets nationally. They are distributed in the bike industry by BTI, VeloSport Imports and others. Floyd's of Leadville displayed at the recent Interbike show in Reno, Nevada, and there was chatter there that the company was considering an initial public offering to raise capital for expansion in the fast-growing CBD market. Landis told BRAIN that an IPO was just one of several options the company is exploring. "We are looking into that part of it. I don't know which direction we'll go with it," he said in a phone interview after the Reno show. An IPO on U.S. public markets would be difficult because of federal regulations; however, several U.S.-based CBD suppliers are traded on the Canadian Stock Exchange.